In just a week, selected veterans and rookies will report to Leigh University to kick-off the Eagles 2010 training camp. When the Eagles take the practice field, there will still be a ton of questions that need a resolution especially if the franchise expects to be contenders in a loaded NFC and NFC east division. Additionally, there will be plenty of starting gigs that can be won or lost in the heat of Bethlehem. It is not just the starters spots that are up-for-grabs, but the key backup position as well. On every NFL team, there will be a rash of injuries and the only way to counter those injuries is with solid depth. This is the reason why the competition at the backup positions is just as vital as the players fighting for a starting job. For the Eagles these are the top five positional battles heading into the July 26 training camp. Last year, the Eagles had one of the most explosive offenses in the league since they could hit a home-run at any time with the dangerous wide receiver duo of DeSean Jackson and Jeremy Maclin. However, like clockwork, the Eagles seemed struggled as they got into the red zone. Maybe it was an inaccurate quarterback. Maybe it was the lack of a cohesive offensive line. Or it may have been the lack of a true power running back to fight for those tough yards inside the red zone. Although logically it could be that none of the wide receivers on the roster had the size that Hank Baskett and rookie Riley Cooper possess. Before the Eagles got to their second game of the season, Baskett was released to clear room for Michael Vick and to sign veteran Jeff Garcia since Donovan McNabb's fractured ribs. Eventually Baskett signed with the Colts and the rest was history. In this offseason the Eagles decided to bring Baskett back into the fold and draft Florida wideout Riley Cooper. The most intriguing part of this battle is that Baskett has NFL starting experience and two of the longest pass plays in Eagles history, but Cooper has more upside and athleticism. In fact, Cooper has physical tools that will allow the Eagles to install the fade route into the playbook. A route rarely used during the McNabb era. Inside the 20s where the field gets drastically smaller, size can make up for the lack of throwing windows that a quarterback has at his disposal. This is a reason for the fade route is essential to a good red zone offense. Unfortunately, the fade has always been a problem over Baskett's career. On the other hand, Baskett is a special teams stud, which probably gives him the upper hand in this camp battle. While Baskett is the frontrunner to win the fourth wide receiver spot, it should shock no one if Cooper shines during the preseason and wins the job. At the end of last season, seventh-round rookie Moise Fokou found himself replacing Chris Gocong as the starter at the SAM linebacker position. Defensive coordinator Sean McDermott needed to get Gocong out of the starting lineup because opposing team's tight ends caught passes all over the field against him. While Fokou fixed one problem, he created another. His frame was too slender to be a force against the run. In addition, he was constantly out of position or took a poor angle to the ball carrier. However, that was only part of his downfall. Fokou had a propensity to commit a stupid penalty due to his aggressive style of play. By the end of the season, he finished with a team high in defensive penalty yards. 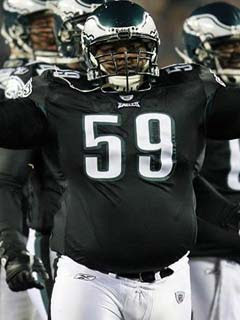 Still, the Eagles like his swagger and confidence that he brings to the field. Plus the coaches feel with a full offseason of conditioning, learning the playbook and weight lifting that he could be an excellent linebacker for the next decade. Even though Fokou is expected to be the starter, he will have to fight stiff competition to keep his job. Last year, Akeem Jordan demonstrated that he could be a solid contributor on the Eagles defense. Before his costly leg injury (healthy for the first eight games) Jordan recorded 53 tackles, a sack, two interceptions and five pass deflections. After missing a couple of weeks, Jordan struggled to recover his early season form. It is unknown whether that was due to the Eagles moving him to each linebacker position or due to the leg injury nagging him. If Jordan can regain his early season form, he should be able to push Fokou for the starting SAM linebacker spot. Moreover, if Fokou cannot cut back on his penalties, then Andy Reid could be forced to use Jordan at the SAM linebacker position (even though he is a natural weak-side linebacker). This camp battle is being overshadowed by more pressing concerns, but Fokou is by no means a lock as the starter. 3. Number Two Cornerback: Ellis Hobbs vs. ? One of the most puzzling moves that general manager Howie Roseman made this offseason was trading away the team's most consistent defender and leader in cornerback Sheldon Brown. It was not actually the fact that he traded Brown to Cleveland (considering his demands for a new contract before the 2009 seasons), but that he replaced him with Ellis Hobbs. While with the Patriots, Hobbs was teamed up with current Eagles starter Asante Samuel and the tandem got within one game of a perfect season. Although that fact is a bit deceiving because Tom Brady, Wes Welker and Randy Moss were the driving force behind the club's 18-1 record. Furthermore, the very next season Hobbs gave up the most touchdown passes of any cornerback in the league. If that was not bad enough for Eagles fans, Hobbs suffered a severe neck injury against the Cowboys in week nine. Ultimately the injury required season-ending surgery. Today, his neck injury is still a major concern for Philadelphia considering he has not made it through an entire OTA practice. Despite those concerns, do the Eagles really have any other options at No. 2 cornerback position? The Eagles will try to trot out Joselio Hanson to compete with him, but he was not the same player after coming back from his four-game suspension (due to league drug policy). Moreover, he is more suited to play against team's slot receivers than he is on the outside due to his lack of recovery speed. So where does this leave the Eagles? Three players that come to the forefront are Trevard Lindley, Macho Harris and Dimitri Patterson. Patterson is probably a casualty of the numbers game with Harris being moved back to cornerback. It would not be surprising if Patterson were cut. This leaves Lindley and Harris to compete with Hobbs. Without a doubt Harris did a respectable job as the Eagles starting free safety as a rookie. Nevertheless, he didn’t develop into the playmaker the Eagles needed and were counting on. Of course the reason he didn’t come up with more turnovers was because he was forced to learn an entire new position on the fly. Still, he was moved out to safety was due to the fact he lack the speed to play corner on the outside. Like Hanson, he might be better suited to play against the slot receivers. Ultimately, Lindley is the only player that is really that has an excellent chance to compete with Hobbs. Before his lackluster and injury filled senior season, Lindley was projected as high as a late first round pick. Also, many college football gurus claimed him as the best cornerback prospect. In fact, analysts compared his game to Eagles corner Samuel since he shies away from making tackles, but is not afraid to jump routes and make the big play. While Roseman speaks highly of Hobbs, his neck injury might hold him back. Lindley should not be starting this early in his career, but he might be thrusted into the starting lineup due to no other options. Against the Cowboys, the Eagles defensive line was absolutely manhandled. Since the defensive front seven barely touched Tony Romo, he had all day to pick apart the secondary. The primary objective for the Eagles this offseason was to improve their front four and pass rush so that this would not happen again. First the Eagles traded away Chris Clemons to the Seahawks for pass rushing specialist Darryl Tapp (and released aging DE Darren Howard). The former 2006 second-round pick out of Virginia Tech came into the league and had a solid rookie season. He accumulated three sacks, an interception, a forced fumble and 33 tackles. His play was so inspiring and impressive, the Seahawks made him the starting LDE the following two seasons. Over the next two years, Tapp flourished and compiled 12.5 sacks, but then took a giant step backwards in 2009. He struggled to get to the quarterback and put up only 2.5 sacks. Furthermore, he lost his starting gig and got lost in the shuffle. Now the Eagles hope he can resurrect his career and put up numbers from his previous two seasons. Besides Tapp, the Eagles decided to totally revamp the defensive end position by moving up in the first-round to acquire Michigan's Brandon Graham. Graham might not have the long arms like Mario Williams, the athleticism of Julius Peppers or the size of Jared Allen, but what he lacks in ideal qualities of a defensive end he makes up in heart. One of the reasons that the Eagles were so drawn to him was due to his relentlessness to get to the quarterback. The smallish defensive end has been compared to former Eagle Hugh Douglas and even a miniaturized Dwight Freeney; both are players that never take plays off and have had successful NFL careers. Then there is old mister reliable, Juqua Parker. Every year it seems like the fans, analysts and experts write off Parker. Just as they write him off, Parker seems to find himself back in a familiar role... the starter at left defensive end. The 32-year old is coming off a career year with eight sacks and two fumble recoveries. No one would be shocked if Parker holds down the starter position for the first couple of weeks until Graham fully understands the defensive scheme. A player that has been the forgotten man this offseason is Victor Abiamiri. The former 2007 second-round is not expected to be ready for training camp since he is recovering from microfracture surgery to his knee. This could ultimately end his tenure in Philadelphia. Another reason he could be done in Philly is that Abiamiri has never lived up to his hype. Many believed when the Eagles drafted him that he could be like former Notre Dame great and Giants do-it-all defensive end Justin Tuck. Instead Abiamiri has struggle and only recorded four sacks in three seasons. However, if he is able to recover the raw talent is there. For him it is just a matter of staying healthy and utilizing his strengths. As of right now, Parker is projected as the starter at left defensive end. Nonetheless, there was a reason why the Eagles found the need to trade for Tapp and draft Graham (not only Graham but Ricky Sapp and Daniel Te'o-Nesheim). Certainly Parker is a nice asset to have in a rotation, but he is not going to free up Trent Cole from double teams. Graham is the guy that can clear up room for Cole and the rest of the defensive line. However, he is still unsigned with camp a week away. If he doesn't get a contract before the start of training camp, this becomes a two-horse race between Parker and Tapp. The biggest injury last year was not the loss of Brian Westbrook for a couple of weeks or even middle linebacker Stewart Bradley (although it definitely hurt the defense), but the loss of center Jamaal Jackson. When Jackson went down with a torn ACL against the Denver Broncos in week 16, the Eagles season went down the drain as well. His injury will continue to be felt this year as he is expected to begin the season on the PUP list (Physically Unable to Perform-- means cannot be activated until week 6). Reid and offensive coordinator Marty Mornhinweg attempted to slide Nick Cole from right guard to center since he played the position while in college at New Mexico State. Sadly, Cole was destroyed in back-to-back weeks by Dallas nose tackle Jay Ratliff. To no ones surprise, the Eagles offense also struggled to move the ball down the field and put up only two touchdowns in eight quarters of football. Of course, the center position was not the sole reason for the Eagles demise. Although it was definitely a key factor in the offense sputtering in the last two games against Dallas. Unquestionably Cole is a valuable backup offensive lineman and spot starter to have on the 53-man roster since he can play multiple positions. However, he lacks the ideal size for the position that Jackson and Mike McGlynn encompass. Even though McGlynn has never taken a regular season snap in the NFL, the Eagles have always envisioned him being a strong candidate to eventually replace the Jackson at center. In college, McGlynn was strictly used as a guard, but with his athleticism, size (6,4, 315), and strength he can be molded into a dominating center. More importantly, McGlynn takes the field with a nasty mean streak, but plays with a very high IQ. Both are required to be the anchor of an offensive line and call out other team's blitzes at the line of scrimmage. In spite of this, Cole is going to be the team's first option due to his playing experience. Nevertheless, this will be an ongoing battle through training camp and the regular season. If McGlynn can perform at a high-level during the preseason then he might be able to overtake Cole as the team's starting center. Nice list, I would agree that center is a big concern. I think Graham will do a fine job in the starting role from day one but who knows with a rookie. Hobbs scares me like many at the cornerback spot, and given the potential problems up front I am really concerned. Of course there is no "battle" at QB but I would say it is a question mark. I was going to put another battle of the safety position. I think Allen is projected as the starter but he is still not signed and that could potentially hurt him in learning the playbook and defense. This means that Quintin Demps would be the starter or rookie Kurt Colem or Macho Harris would be forced to move back to safety. That could be another battle. Another could be the main backup linebacker. Omar Gaither and Akeem Jordan can both play all three LB positions. And it is a vital role for the Eagles. Backup QB is a battle only cause Vick might not be with the team considering all off the problems he has had over the last month. Um last i checked Te'o-Nesheim was the #1 DE at the combine (just look at the stats). And posted 1/2 a sack more in college then Graham. I would be shocked if he's not starting at the end of the year as not only is he a better rusher than Graham, he plays way better against the run.